A big chunk of my MA thesis was on radio demobilization projects in the LRA conflict (shameless self-promotion: new [gated] article about it in ASR! ), and I’m hoping to do some more work on it this summer as I sort out my next project (The Dissertation). A common theme that came up throughout my research – both in the field and in looking over documents and videos from groups working in the region – was the frequent blurring of different categories. I’ll illustrate by thinking my way through and around this recent article in the Daily Beast, “Joseph Kony’s Former Bodyguards Are Now Helping US Troops Hunt Him” by Kevin Maurer. The article is centered around a recent incident in which LRA leader Joseph Kony’s guards fired on his house before escaping to a distant U.S. base where they surrendered, and since then they have been assisting the U.S. in counter-LRA efforts. This incident is definitely worth talking about – as several interviewees note in the article, this is an incredibly bold move by the abductees, and it only reinforces the continuing story that the LRA is shrinking and its command structure collapsing – but beyond just this incident and even beyond this article, I want to tease out some of the blurring that’s happening in the conflict and in how it gets represented. This latest shift in discourse, paired by a shift in programming on the ground in the region, puts Invisible Children on new terrain. Where most NGOs operate in a place of aid and development, they rarely endorse military action or engage in collaborations with military forces. Even in Uganda, where humanitarian organizations were complicit in the government’s violent displacement policy (Branch 2008 [pdf]), NGOs did not endorse military action nearly as explicitly as Invisible Children has. 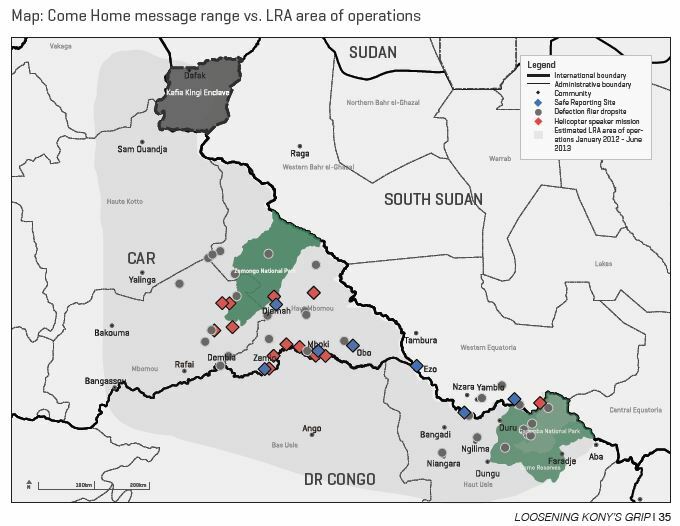 By using an early warning network that relies on FARDC, assisting the UPDF and U.S. army advisers in establishing a military presence in the region, and using come home messaging as an effort to disrupt LRA activity, Invisible Children has moved into uncharted territory in its contribution to the militarization of humanitarianism. Quoted in a recent news article, the organization’s Program Manager for Counter-LRA Initiatives Sean Poole stated that “Invisible Children does not claim to be neutral. You know, we are not in this conflict saying we are not going to take sides” (Gonzales 2014). I think an aspect of this linguistic shift is creeping militarism in humanitarianism, writ large – a problem bigger than Invisible Children or the LRA conflict, but rather a part of the post-9/11 securitization of (Western?) society. But, linguistic analysis and militarization critique aside, the fact of the matter is that some of the former LRA fighters who come out of the bush do actually help counter-LRA forces, effectively defecting to the other side in this conflict. Defection is happening. I don’t think that negates my argument, which has to do more broadly with humanitarianism, militarization, and ways of speaking and thinking. Still, the linguistic practices are still doing a lot of work in Maurer’s article. When Maurer refer to these former child soldiers who have demobilized as “defectors,” the logical point of progression is that they will assist the U.S. in helping track Kony – that’s what a defector would do. If we started by calling them returnees or formerly abducted child soldiers, we might have a different perspective; maybe we would stop and wonder whether they should still be engaged in warfare at all, regardless of which side. The American military intervention, promoted by Invisible Children as essential to any solution, has itself been described by a US army officer on the ground this way: “These ex-LRA guys don’t have many skills, and it’s going to be hard for them to reintegrate,” he said to the New York Times. “But one thing they are very good at is hunting human beings in the woods” (10 April 2010). With a statement like this in mind, we ought to be more uncomfortable than ever with President Obama’s waiving of the Child Soldiers Prevention Act for some of the very countries where the LRA is active. The use of former child soldiers to help track Kony has been happening for a long time now, but should it? Does completing reintegration training do anything if you immediately head back into the bush with a gun, just under a different flag? Is that really reintegration? What does it mean to demobilize if you stay in a state of war? Is that really demobilization? Will these child-soldiers-turned-soldiers ever truly disarm, demobilize, and reintegrate? The use of former LRA to go back into the bush where they spent recent years might have negative consequences for the returnees themselves, but it also feeds into other forces at play. How do victims of LRA violence feel, knowing that former LRA fighters are now coming back as counter-LRA fighters? When I was taking a break from interviews in northeastern Congo, one of the men I was with accused the UN of helping the LRA. Another interviewee told me that one of the issues the radio demobilization programming ran into was that locals that it was actually a coded message the Ugandan military used to coordinate with the LRA to attack civilians. Does actually using former LRA fighters do anything but exacerbate such beliefs? In the same instance, it’s worth noting that employing (deploying?) former child soldiers as soldiers pulls us away from the question of accountability. There’s a lot of ongoing debate over whether child soldiers – particularly ones that grow up to become adults and therefore legally responsible for their actions – should be held accountable. Much ink has been spilled on the place of child soldiers in justice after atrocities, and the issue continues to be debated (most recently in this symposium and my article on ICC-indicted LRA returnee Dominic Ongwen). Even from the perspective of LRA victims, it is often debated [pdf]. Child soldiers can (and should) be seen as victims too. Sometimes that leads to sympathy or solidarity between different victims, sometimes that leads to a perceived hierarchy of victimhood, sometimes it gets rejected completely and people see child soldiers as perpetrators instead. Often this depends on how the individual is portrayed – some get more sympathy than others. When child soldiers grow into adult rebels, this gets murky enough. When the now-adult abductee rebels surrender and then take up arms as former abductee, former child soldier, now state soldier, things get even messier. How should local civilians interpret their change of uniform? Part of the reason even adult abductees and former child soldiers can be seen as victims rather than perpetrators is that every decision they make is shaped by the environment they find themselves in, and therefore the level of accountability or responsibility might change. For returnees who may not be able to imagine life after war, is choosing to switch sides rather than disarm still a decision in a wartime environment and a wartime mentality? One of [the] highest profile defectors was LRA commander Dominic Ongwen. He surrendered in January 2015. He was one of five high-ranking LRA officers indicted by the International Criminal Court for war crimes. After Ongwen’s defection, military officials had him record a message urging his fighters to defect. The U.S. soldiers said many of the defectors said hearing Ongwen or other defectors on the radio convinced them it was safe to leave Kony. “We try and let them know what is available to them,” the soldier said. [Brownyn] Bruton [of the Atlantic Council] said there is some indication that LRA fighters listen to the radio and get the leaflets. The promise of amnesty is tempting. But Ongwen wasn’t able to wipe the slate clean. He received no amnesty. He demobilized and then was arrested and is now on trial. Ongwen might be an example of the success of the radio come home messaging, but to say that he defected – and then to equate that with amnesty – glosses over a lot of detail. It makes demobilization programming explicitly counter-LRA and a tool for fighting rather than a tool for not-fighting, a tool for demobilization. It also obscures the fact that Ongwen was sent to The Hague and has now been charged with more war crimes than anyone in history, surprising for a child soldier (again, see the JiC symposium or my Warscapes piece for more). On the ground in the LRA conflict, returnee experiences are in the plural. Some returnees were never abducted, though most were. Some returnees received amnesty, while many enjoy freedom (or impunity, depending on how you look at it) but without official documentation. Two men are actually in jail cells, one in The Hague and the other in Uganda, both pending controversial trials. Many reintegrate into their old homes, some reintegrate into the army, some don’t reintegrate at all and move away to escape ostracism. Much of the literature on the LRA sees one process, but there are many, many ways that demobilization and reintegration occur. Blurring these together obscures that, and blurring them into defection obscures even more. But, in this very blog post I’m also blurring some representations of the actors involved. Child soldiers, inherently through the act of abduction and conscription, lack a certain level of agency in the legal sense, but also in scholarly and journalistic and humanitarian discourse. A lot of the back and forth in discussing the actions of abductees (and, me above, returnees) is shaped by this refusal to grant/recognize agency. But former child soldiers (or even active child soldiers) can be said to make their own decisions – decisions structured by the violent circumstances they find themselves in, of course, but decisions nonetheless. The question remains whether, upon demobilization, taking up arms against the LRA is a decision shaped by structures of conflict or structures of post-conflict. Some post-conflict agreements include not necessarily demobilization but reintegration into the national army, after all. Is that what’s happening for these fighters? It’s not clear how long they will continue to act as soldiers, or if they’re role in helping Uganda and the U.S. in counter-LRA efforts may end up taking them as AMISOM soldiers in Somalia or as riot police to Kampala or contractors in Baghdad. So, my own hesitation against turning demobilization into defection and turning former child soldiers into soldiers also steals away a certain agency for these individuals. Child soldiers could become soldiers, and they could defect. Who is to say they can’t take up arms? Can former LRA returnees still desire regime change in Uganda at the barrel of a gun? Can they desire to end the LRA once and for all, even if it means staying in the bush a little longer to help the U.S.? Questions of agency in wartime are hard ones to answer, but they are questions worth asking again and again. But, in asking them, I’m trying to avoid blurring different categories together. As this erasure keeps happening, language and representation obfuscate what’s happening on the ground. In doing so, we may be closing off possibilities and asking the wrong questions. In response to intense violence that included conscription of civilians into rebel ranks and atrocities on a mass scale, some civilians in northern Uganda have tried to end the war through reconciliation in the form of forgiveness, amnesty, and peace negotiations. One means of promoting these ideas has been various types of radio messages. This talk will focus on radio messages that encourage abducted rebels to surrender and come home and will look at how the radio messages – and notions of reconciliation – have traveled across borders. There has been a lot of bad news coming out of the Central African Republic as violence across the country has spiked. The Red Cross announced that almost 500 people had been killed just in Bangui. The French are already on the ground trying to mitigate violence, the U.S. is airlifting a Burundian force to the area, and the African Union is trying to beef up its presence there as well. For those interested in understanding or examining the violence more, there are two things worth reading: Louisa Lombard wrote an insightful piece explaining whether or not the violence constitutes a genocide or genocide-in-the-making, as the French have claimed. International Crisis Group also has a report on the situation in CAR, as well as a short post on Bangui. Peter Bouckaert at Human Rights Watch wrote a dispatch detailing just one of the many incidents that have happened there. With all of this bloodshed going on, it was uplifting to hear news of a large defection of LRA fighters in the east of the country. Separate from the anti-Balaka/ex-Seleka fighting (for the most part), the LRA has been active along the periphery of CAR. On December 6, a group of nineteen LRA fighters went to a small village west of Zemio and surrendered, agreeing to demobilize and return home. According to Invisible Children, the group decided to surrender after hearing a number of radio programs that promoted surrender and defection. This is a big boost to the defection messaging program, and also a small glimmer of hope in a country that’s going through a pretty rough time right now. In the course of my fieldwork this summer, a question arose that I was unable to answer, and it concerns the inconsistent response of the LRA to the work of radio stations in northern Uganda. My research focused on the use of defection messaging, which several radio stations engaged in during the conflict, especially in the early 2000s. But there were other ways that radio was used during the conflict, and of particular note is Radio Mega’s attempt to foster dialog between the rebels, the government, and the civilian population. In her essay [pdf] on the government-imposed limits that radio actors encounter at Mega FM, Maggie Ibrahim chose as a case study the Ter Yat (“Under the Tree”) weekly dialog program at Radio Mega. In December of 2002, LRA leader Joseph Kony called into the program to discuss why peace talks had failed – other panelists included an army spokesman and a local government official. This was just one instance of many in which members of the LRA called into the radio station on various programs to talk about the conflict or send messages to others. After three months of this type of communication, security forces informed the radio station that rebels would not be allowed to call in again. This was couched within the Anti-Terrorism Act, which was criminalizes interviewing alleged terrorists. 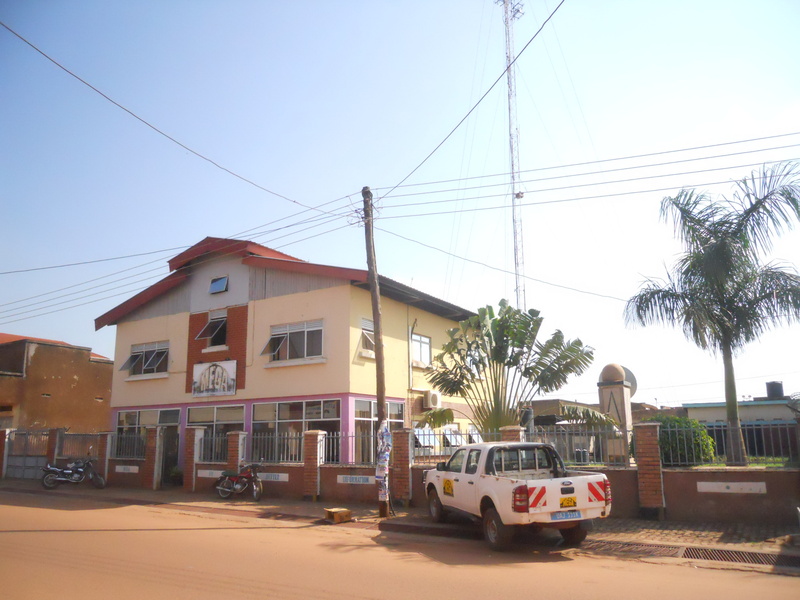 Mega FM radio station in Gulu town. In the interviews that I conducted in Gulu, it became apparent that in the early 2000s there was a lot of contact between radio staff and the rebels. The rebels’ only source of news was the radio, and so the radio stations were frequently used to disseminate information and to communicate with the broader community. This, of course, was happening while Mega FM was simultaneously carrying out its defection messaging, which served to sap rebel strength and encourage escape attempts among disillusioned or abducted members of the LRA. The fact that the rebel leadership continued to engage in dialog with an entity that was also actively undermining it seems illogical. And then we turn to Radio Wa, a radio station in Lira, southeast of Acholiland in the Lango Sub-Region. Radio Wa began running defection messaging in 2002, and was very effective in encouraging defections during the early 2000s, especially as rebels moved through that area after a UPDF offensive in 2002. Unlike with Radio Mega, there was no contact with the rebel leadership except for rumored threats against radio staff. In September of 2002, the rebels made good on these threats and destroyed the radio station, attacking early in the morning and burning it down. Both radio stations actively encouraged LRA fighters to escape and take advantage of the amnesty. Both radio stations saw themselves as supporting community efforts to achieve peace by bringing the LRA home. And yet the rebels chose to engage in public dialog with one radio station while burning down the other. There could be a lot of different reasons for this. In 2002, as I mentioned, the rebels were reorganizing from an attack by the military, moving into new areas in which they had never been active before. The LRA has its roots in Acholi territory, and many of the top fighters are familiar with some of the Radio Mega staff from early attempts to bring the war to an end. Lira has little history with the rebels, and this lack of connection may have led to the rebel attack. Most of my blogging from this trip will be more about research than traditional travel-blogging, but I’m doing a short e-mail newsletter for friends and family. If you’d like to be included on that list, feel free to comment or e-mail me at scootles7 [at] gmail [dot] com. So, I’ve been in Uganda for a week now. My research has been slowly progressing, which already puts this trip as wildly more successful than my last sojourn to this country, which I deemed “a failed attempt” at an internship. I’m nervous about the Congo portion of the trip not least because it’s the Congo and all of the associations, realistic and overblown, that come with that, but also because I don’t speak a bit of French, Lingala, or Zande and because the schedule is very, very up in the air. But, for now, it’s nice to be back in Uganda and be (somewhat) active in my work. So far, I’ve interviewed the head of radio for Invisible Children and the program director for Mega FM, one of the biggest stations in the north. These interviews have all been about defection messaging, also called come-home messaging (dwog paco in Acholi). The messages include former rebels telling other rebels that it is safe to come home, encouraging them to take advantage of the amnesty law. You can find out more about these messages here and even hear some samples clips in different languages at The Voice Project. It is widely agreed that the radio messages are extremely effective. This isn’t just coming from the people who work in radio, it has been labeled by aid workers and peace advocates as an effective means of encouraging LRA escapes and surrenders for some time now. Mega FM was started with a large amount of funding from DFID with come-home messaging in mind, USAID’s policy on the LRA includes capacity-building on radio defection efforts, and this programming has recently been a primary thrust of Invisible Children, which states that 89% of returnees cite the messaging as one of the reasons they returned. Hardly anybody from the sample heard about the amnesty while still in the barracks and reception center staff have confirmed that most who arrive in the center do not know about it. Of those who had heard about the amnesty, many had a negative impression of what it actually meant. In the bush, LRA commanders tell combatants that the amnesty is actually a government ploy to lure people out of the bush and kill them. Commanders deny their soldiers access to radios and make every attempt to suppress information. Many reception centers say that, anecdotally, returnees say that they try to sneak around and listen to radios when they can to hear news from home, and that is how they find out about the amnesty. This report was written in 2005, so perhaps things have changed between then and now, or perhaps some center staff had different experiences. Allen and his team raise some concerns about the reliability of returnee anecdotes, citing that one of the jobs of reception center staff is to teach returnees how to talk about their experiences in constructive ways. Some returnees may be picking up that they should cite radio regardless of their personal experience, either as an unintentional side-effect of the rehabilitation process or as part of the belief that it will get them better aid packages.The point remains that there is some ambiguity over how much access to radio the lower-level members of the LRA have. My research is predominantly on how the messaging works, which may or may not assume that it works. I’ve been an ardent supporter of messaging, but Allen and Schomerus provide some important arguments to keep in mind. The biggest spike in returns occurred during a time of both heightened radio programming and a major military attack in the early- to mid-2000s, so it’s hard to figure out which event had a bigger impact. No doubt both played a role, and I’d much rather advocate for radio messages than military action. And so that’s what I’ll be studying, and we’ll see how it goes as I move forwards. See update below. With two interviews down, I’ve traveled back to my old stomping grounds in Lira today. Tomorrow morning I’ll be visiting Radio Wa, a Catholic radio station here that also did come-home messaging, called karibuni programming, which is inexplicably a Swahili word in a region where few speak it. I might ask about that. I’ll be back in Gulu tomorrow to round out my radio-in-northern-Uganda interviews, and then be moving onto other things. Besides that, I’ve been doing a lot of things most expats do: using the internet, eating street food (although there’s a disappointingly small amount to offer in Gulu), avoiding eye contact with other expats, while also making friends with some expats. Same old, same old, here in Uganda. Question for you: Tim and Mareika’s points (at least the ones you’ve mentioned in your blog) were specifically about whether or not AMNESTY messaging was encouraging defections. That can be differentiated from come-home/defection messaging more broadly. We’ve found that several recent LRA defectors have referenced defection messaging as having a role to play in their surrender/escape, while they might not necessarily specifically mention Uganda’s amnesty policy. Some LRA seem to just need assurances that if they surrender, they will have a safe place at which to defect, where they will not be hurt by the FARDC, FACA, or local community, and they want to know that they will be able to go home. We’ve also been the degree to which reintegration programs/packages are actually more important to LRA defectors than an amnesty certificate itself. The distinction between amnesty (as legal protection from prosecution) and a more comprehensive reintegration program might be something you’ll want to look into. Thanks again for your work. I think you’re right to differentiate between amnesty messaging and general come-home messaging, and the first portion of Tim & Mareike’s report that I quoted was specific to amnesty and how the UPDF treated it… but the latter section questioned how often lower-level rebels actually listened to the radio at all. I know a lot of people have told me that rebels sneakily listen in when they can, but the report gives a few reasons to be wary about returnee anecdotes. I do want to restate that, broadly, I’m on team radio on this topic. I really do think it’s done a lot of good, and I think it’s a positive way to bring about more escapes and surrenders. Looking at some of the data, I just wonder if it’s playing as big a role as we think it is. I think flier drops and aerial loud-speakers are a great addition to this that may indeed improve upon the radio method. Greetings, dear reader. It’s been a while, hasn’t it? I’m sorry for inundating you with only weekend reading lists and none of the usual amateur commentary that usually comes along during the week. Things have been busy here – I’m halfway done with my time at Yale now, and final papers this semester were a wreck for me. Now that school’s out, though, I have a small group of draft posts waiting in the wings. Until then, though, I thought I’d give you an update on recent occurrences in the House of Backslash. In the early 2000s, a radio station in Gulu, northern Uganda, ran programming that urged defections from the Lord’s Resistance Army, which is comprised predominantly of conscripted youths. The defection messaging promoted the Ugandan government’s amnesty program and encouraged rebels to surrender and be reintegrated back into their home communities. There has been a lot of fanfare about the defection messaging, but it hasn’t been without criticism. During the mid- to late-2000s, the LRA moved westward towards northeastern Democratic Republic of Congo (DRC) and eastern Central African Republic (CAR). Since then, radio stations in both of those countries and South Sudan have been using similar tactics in urging defections. Meanwhile, organizations such as Catholic Relief Service and Invisible Children have helped patch together a network of HF radios that function as an early warning system for villages that are in danger. My research plan is to better understand how radio is used in the LRA conflict and how it affects people in the region. I hope to be conducting interviews in Gulu about radio’s use in the early 2000s, and then doing the same for contemporary usage in Yambio, South Sudan, and Dungu, DRC. The goal of these interviews will be to get a clearer picture of what the radio programs said, who was in charge of determining the programming, and how radio stations dealt with outsiders’ (NGOs or the government) involvement in their work. I will then (hopefully) visit villages in DRC, most likely in Haut Uélé district, to learn about the HF radio stations. Similar to the first phase, I hope to learn more about how the messages function, who is in charge of operating them, and how villagers interact with those who help establish the stations. I would also like to look into how the messaging system affects the daily lives of civilians in these areas, and am interested in learning if the radios are used for anything beyond the NGOs’ intended purpose. Lastly, I’d like to evaluate the effects of the defection messaging in terms of actually encouraging defections. Both of these sections will depend on my resources and the situation on the ground, so I’ll provide updates once I’m there. I’m sure I’ll be writing about this over the course of the next year. I’ll try to post research notes from the field, and I’m sure that I’ll use the blog as I plod through the thesis-writing process, especially in preparation for any presentations I have to give. If you have any questions or comments, go for it. If you’ll be in any of these places, we should chat. As I prep for my trip, I should probably thank the Lindsay Fellowship, the Coca-Cola World Fund, and my parents for their financial help, my wife and my friends for the emotional support, and a host of grad students and professors for their intellectual help. I have never done a lot of the things I’ll be doing, and I’m glad I’ll have all three kinds of support throughout. As we get closer to June (I’ll be leaving at the beginning of the month) I’ll let you know more about my plans. Until then, keep on keeping on everybody.